September 26, 2017, Bengaluru - Vista Equity Partners, the world’s leading private equity firm, focused exclusively on enterprise software, data, and technology solutions, together with several of its companies in India, partners with Akshaya Patra by pledging a contribution of USD 1 million over five years to aid in the Foundation's mid-day meal plan. September 26, 2017, Bengaluru - Vista Equity Partners, the world’s leading private equity firm, focused exclusively on enterprise software, data, and technology solutions, together with several of its companies in India, partners with Akshaya Patra by pledging a contribution of USD 1 million over five years to aid in the Foundation's mid-day meal plan. Robert F. Smith, Founder, Chairman and CEO of Vista Equity Partners, recently named by Forbes as one of the 100 Greatest Living Business Minds, announced the collaboration alongside Mr. Hardeep Gulati, CEO of PowerSchool, and Mr. Shridhar Venkat, CEO of The Akshaya Patra Foundation. The pledge was announced during the opening of the new offices of the education-technology firm, PowerSchool. PowerSchool provides software solutions to schools in over 70 countries, it will continue to hire talent, and expand its presence in Bengaluru, joining eight other Vista portfolio companies with operations in India. 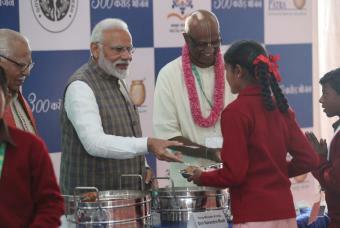 This philanthropic investment in Akshaya Patra Foundation’s mid-day meal program demonstrates Vista’s and the Vista companies’ commitment to creating access and opportunity for young people to reach their potential. The initial investment will be used to purchase trucks to transport meals to schools in various areas of the country. With $200,000 USD granted each year, contributions will aid the delivery of meals to 80,000 students per day, and over 18 million meals per year. "Our culture at Vista emphasizes the importance of positively impacting and engaging with the communities in which we live and work,” said Robert F. Smith, Founder, Chairman and CEO of Vista Equity Partners. "At Vista, we invest in the future. And Akshaya Pat4ra’s work does that. By ensuring that students across India have the nourishment they need to be able to learn, the foundation plays an integral role in the education of Indian youth, and we are honored to help them execute on their mission." With Vista’s presence in India expanding, the Vista companies’ collaboration with Akshaya Patra Foundation represents Vista’s and its companies’ commitment to India and its people. Vista Equity Partners, a U.S.-based investment firm with offices in Austin, San Francisco, Chicago, and Oakland with more than $30 billion in cumulative capital commitments, currently invests in software, data and technology-enabled organizations led by world-class management teams with long-term perspective. Vista is a value-added investor, contributing professional expertise and multi-level support towards companies’ realizing their full potential. Vista's investment approach is anchored by a sizable long-term capital base, experience in structuring technology-oriented transactions, and proven management techniques that yield flexibility and opportunity in private equity investing. For more information, please visit http://www.vistaequitypartners.com. PowerSchool is the leading K-12 education technology provider of solutions that improve the education experience for 100 million students, teachers, and parents in over 70 countries around the world. We provide the industry’s first Unified Classroom experience, empowering teachers with best-in-class, secure, and compliant online solutions, including student information systems, learning management and classroom collaboration, assessment, analytics, behaviour, and special education case management. We streamline school office and administration operations with online solutions for student registration, school choice, and finance/HR/ERP. We drive student growth through digital classroom capabilities and engage families through real-time communications across any device. Visit https://www.powerschool.com/ to learn more. support from many philanthropic donors and well-wishers; Akshaya Patra has grown from humble beginnings serving just 1,500 school children across 5 schools. Today, Akshaya Patra Foundation is the world’s largest (not-for- profit run) Mid-Day Meal Programme serving wholesome food to over 1.6 million children from 13, 808 schools across 12 states in India.